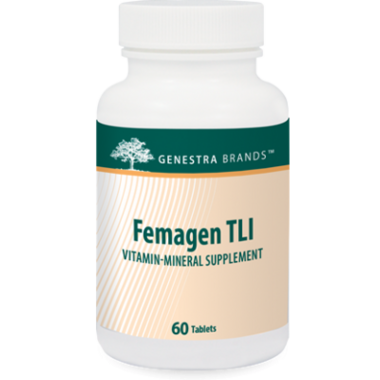 Genestra Femagen TLI is a blend of vitamins and minerals that helps to prevent iron deficiency, the most common nutritional deficiency worldwide. Iron is an important component of hemoglobin in red blood cells, where it is necessary for oxygen transport through the body. Decreased iron storage results disproportionate iron loss, and women require more iron than men due to losses in menstrual bleeding. Vitamin C helps increase iron absorption by reducing iron to Fe2+, the form more stable in the basic environment of the intestines. As a cofactor for the enzyme ceruloplasmin, copper helps oxidize iron to Fe3+. In this form, iron binds its plasma protein transferrin, which transports iron to the bone marrow for red blood cell formation. Vitamin B12 and folate are also involved in red blood cell formation through their roles in DNA synthesis.